This weeks challenge is being postponed untill next Monday! Hi everyone! Thankyou for taking part in last week's doodling challenge. This week's theme is 'Personalise it' - make your project more personal and put a name on it. Our designers have made some wonderful examples for you which we hope you enjoy. A big thankyou to everyone who takes part every week, all your fab work and support is what makes my time to craft challenge! Congratulations to A Portland Granny you have won last week's prize: a Cosmo Cricket paper collection. Please email us at mytimetocraftchallenge@hotmail.co.uk and we will get your prize in the post to you. 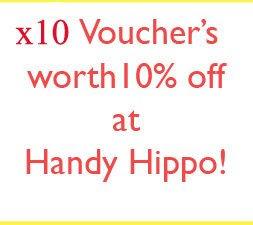 This week's Prize, supplied by Handy Hippo is x 10 Vouches worth 10% off at their online store. Everyone who takes part in this week's challenge by ( 10pm Monday the 27th GMT) will be entered into a prize draw and 10 lucky peoples names will be selected at random! Good luck, we will announce the winners next week. I attached alphabet chipboard letters onto blue card which I ripped to give a snow effect, I added doodling, ribbons, and a brad with a rub-on greeting on it. I started by cutting the large 16 out of mickey mouse paper with my cricut then I matted it on holographic card. Then stuck the numbers onto some bright yellow firework paper. Mickey mouse eyelets were used down the edges. I wrote the name with stickers and finished it all of with some black gems. I covered a card blank with patterned paper. From gold card I cut a heart shape and glued this to the base card. 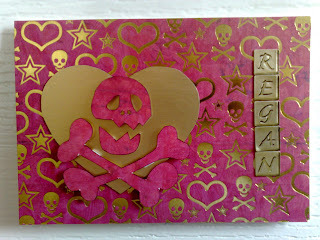 From pink paper I cut out a skull & crossbones, edged it with black ink and attached it with 3d foam on top of the heart. I spelled out the recipients name with alphabet stickers for a personal touch. 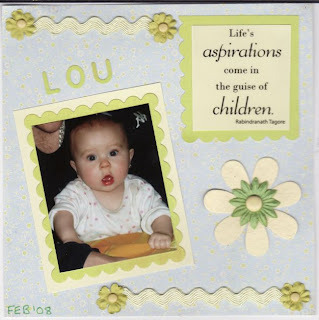 It is a page I made of my granddaughter, using a nestability die for the mats, and a quote, flowers and ric rak to embellish. I cut her name from a QK Revolution alphabet set called Lemonade (I think!). I decided to use the challenge to make my Brother's Birthday card. His hobby is photography so I decided to use an image from the Card Toonz Professional Nuttyness CD. 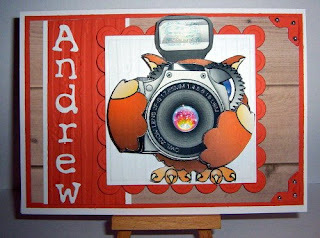 My little Owl photographer is decoupaged up six layers, glittered slightly and mounted onto Nestabilities mats. I used a Sizzix alphabet to personalise the card with his name. Hi everyone! Thankyou for taking part in last week's Teddies challenge - all your work was stunning as always! This week's theme is 'Doodling'. Try adding some freehand drawing to your projects. Maybe something really simple or if you're feeling really brave perhaps try drawing your own image instead of using a rubber stamp! Get your felt tips at the ready and have loads of fun doodling! Our designers have made some wonderful examples for you which we hope you enjoy. Congratulations to Christine D., a portland granny, Ria and RubyMay, you have won last week's prize and each won a fab embossing powder! Please email us at mytimetocraftchallenge@hotmail.co.uk and we will get your prizes in the post to you. This week's Prize, supplied by Crafty Krafts is this 'Cosmo Cricket - Little boys Biography collection'. Everyone who takes part in this week's challenge by ( 10pm Monday the 20th GMT) will be entered into a prize draw and 1 lucky person's name will be selected at random winning this gorgeous prize. Come back next week to see who won! To make it... I doodled three flowers onto patterned paper and placed them onto doodled stems. I then attached a ribbon and a sentiment sticker then finally doodled a scallop border and coloured it with a Pro Marker pen in 'Cornflower' colour. I stamped the leaf image in white stazon then drew around them with white gel pen. I then doodled in the corners. The leaves were then stamped again in bron stazon and then drawn round the same way. I finished it off by writing leaves in white gel pen and adding 3 small gold coloured gems. The leaves were stuck on with silicon glue and all edged with gold krylon pen. I covered a base card with red paper, cut a strip of patterned paper and punched a scalloped border to one edge then adhered to the base. I cut a thinner strip of paper, doodled a border round the edge and placed this across the punched piece. I cut a swirl from paper, doodled on some dots then stuck this to the base card. I stamped the sentiment, added a brad to the centre of a chipboard flower and stuck these to the card. Finally I doodled a border around all four edges of the base card. I stamped a Penny Black Christmas greeting, and doodled all round the edges of it by drawing some holly and berries and faux stitches. I painted in the holly leaves with Adirondack Lettuce Ink Pad and also painted some plain white card so I could mat it after I had matted it onto red. Finally I added some matching green ribbon along the bottom. When I first heard what the challenge was I was wary - I don' t do much doodling as my efforts always look wrong! So my card just has a doodled border around the edge of the circle. I used a Mimi image from Denami Designs and coloured with Zig Brushables and Sakura Stardust pens. matted and layered onto patterned paper and embellished with a decorative corner and some jewelled Flora Doodles! Hi Everyone, Thanks for taking part last week, it's time for another challenge!! we've picked something really cute 'Teddies' so get all your teddy bear stamps out and get creating. 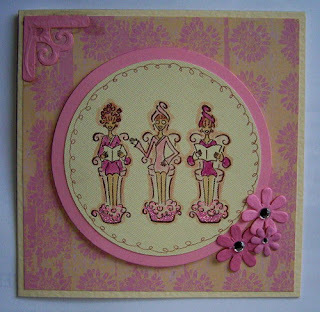 The design team have made some really beautiful cards this week, they really are fab! This week's Prize, supplied by Crafters Companion - are these 4 embossing powders, Colours: Holo Twinkle, White Twinkle, Gold Twinkle and Silver Twinkle. everyone who takes part in this week's challenge by (10pm Monday the 13th of October GMT) will be entered into a prize draw and 4 lucky peoples names will be picked at random winning one embossing powder each! I coloured my teddies with Pro Markers and matted them onto Basic Grey paper, I added an Elzybells sentiment, some craft wire, flowers and brads. I started by using dabbers on a piece of mountboard then I went round the edges with silver krylon though it doesn't show up very well. Then I stamped Linda Luckin's gorgeous teddy - my favourite stamp of all time. I then stamped the words with a versafine ink pad and rubbed around the edges with black. 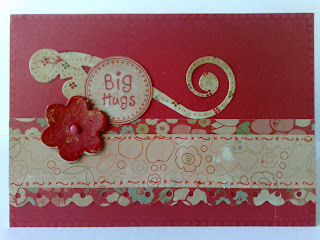 The edge of the dotty paper was punched with my stampin' up punch. 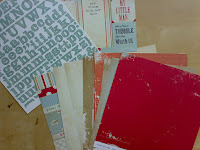 I finished it off with bits and pieces I found lying around on my craft table! I made a DL card base and covered it with green paper. 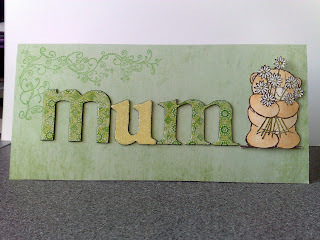 I stamped a swirl in green ink to the top left corner and glued 'on MUM' chipboard letters. On separate card I stamped and coloured a Forever Friends teddy, cut him out and attached him to the base with silicone glue. I covered the canvas in Vintage Photo Distress ink and some Copper dabber. I stamped my House Mouse image on a piece of card and watercoloured it in, then added it to the canvas with a phrase stamped image too. Finally I added some Primas and Stickled the centres and areas of the canvas too. For my card I have use one of the first stamps I bought many moons ago - an Anita's Teddy stamp. I have coloured him with water colours andadded a gold satin ribbon bow. 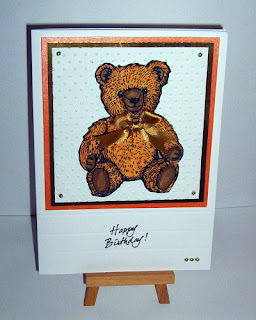 He is mounted 3D over a layered background of Cuttlebug Swiss Dots embossing. 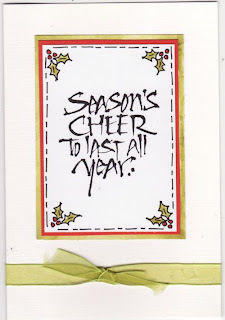 The bottom of the card has a greeting stamped in the center and I have added some embossed lines to finish it off. Embellished with gold brads.